Future glimpsed in Volvo S60 concept | What Car? 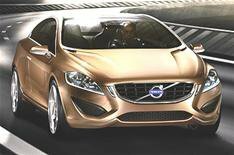 This is Volvo's S60 concept car a preview of the company's next challenger to take on the likes of the BMW 3 Series and Mercedes C-Class. The concept car will be shown for the first time at the Detroit motor show next month, ahead of the production car's debut in 2010. In true concept car style, the S60 concept blends design features that are unlikely to make it to production with more real-world technology that you can expect to see in the new car. Viking ship silhouettes in the headlamps and a crystal-covered floating central stack fall into the first category, but new technology to protect pedestrians is much more likely to reach the production S60. The safety innovation is designed to detect pedestrians who step into the path of the car, automatically activating the brakes if the driver fails to respond. The concept car also has a number of features designed to cut carbon dioxide emissions, starting with the car's 180bhp 1.6-litre petrol engine. It has a system that injects the fuel directly into the combustion chamber under pressure, and Volvo says emissions will be less than 120g/km. The new engine will be introduced into Volvos towards the end of next year.